Please stop thinking, that is a doctored photo of Fred Astaire and Ginger Rogers with my face plastered on Ginger and Jensen Ackles face on Fred. Stop thinking it right now. Because you’re already right. So what’s all this noise about? Why have been reduced to dreamed up something so silly and juvenile? Because if you’ve been reading my blog, you’ve probably noticed that I spend a lot of time explaining how exhausted I am and, recently, it’s only gotten worse, which is why I haven’t posted in a while and why I was finally forced to confront it the other day. There are things that have happened in my life that are really hard for me to talk about, but to sum up, paths I have chosen to take in life really weren’t supported or taken that great an interest in by the people who I think probably should have been. Career and educational paths were never out right said, “You’ve got to be an idiot to try that.” , but they were always “supported” with that as it’s subtext and the added bonus of “And what are you going to do when you fail?” . To those people’s fears and projections of total failure, this idiot succeeded. A lot. This set off a trend in my life of doing really stupid things with out the support of people around me and this trend has sort of become a litmus test for me to figure out who is fair weathered and who you can count on for life. And while I have also realized that is a really stupid way of testing people because I have finally learned, people are going to be there for you or not. Often, if they aren’t there it’s not because they don’t want to be. If they aren’t there it’s most often about something going on with them and nothing to do with you. So be grateful when they are and forgiving when they aren’t because that is what I ask them to do for me. Only took me 30 years to figure that one out. But I digress. And this is how I got so dam exhausted. When you add that up with the stress filled 9 – 6 day job, well, it’s kind of like when you multiply anything by zero, you get zero. Replace zero with drool and that’s all you’re going to get from me at the end of the day. I will produce drool. Really. It’s disgusting. How does any of this connect to Chuck? While fetching coffee for my face a couple of mornings ago I ran into a friend who also has “the dance” about her life and we talked. Ok she smacked me up side the head, as a good strong tattooed lady should do to another when they are being an idiot. 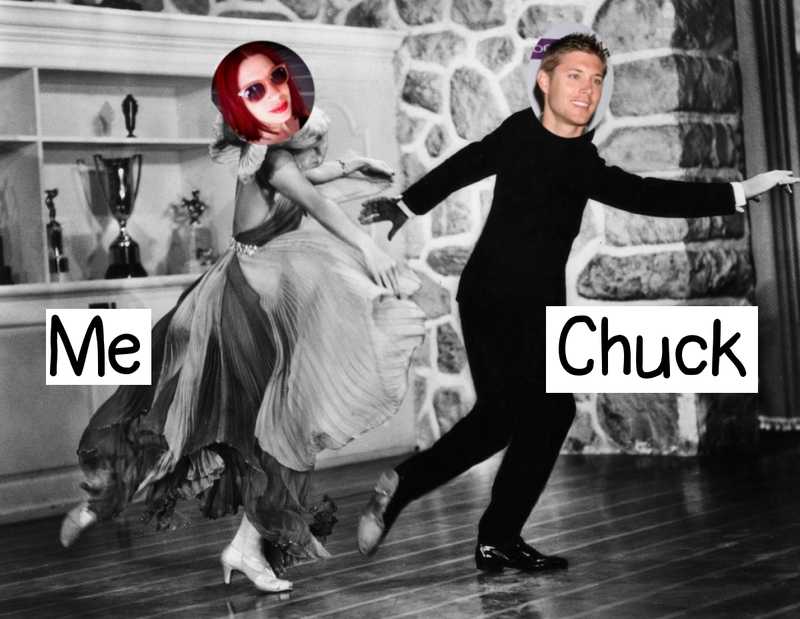 And that’s when the idea of Chuck was born. Oh, Chuckles… sigh. You are my new coping mechanism. So when I need a break, when my body is begging me for a break, I have to tell myself that Chuck really needs some quality time. He’s feeling very neglected and I’m being very unfair to him by putting all these other things in front of our relationship. It’s a good thing to go home and make us dinner. It’s a relationship builder, plus I’ll have time to do things to help me process everything I learned from dance class, write it in my blog and sleep. *Update. My apologies to Jensen. I’m sure that even though we have never met, you are much much more than a pretty face. This entry was posted in ballet, ballroom, ballroom dance, belly dance, burnout, dance, essay, life, love, relationships, students, swing dance, teachers, teaching, Uncategorized and tagged Ballet, Ballroom, ballroom dance, Belly Dance, burn out, Dance, essay, fred astaire and ginger rogers, healthy-living, students, Swing Dance, teaching. Bookmark the permalink.